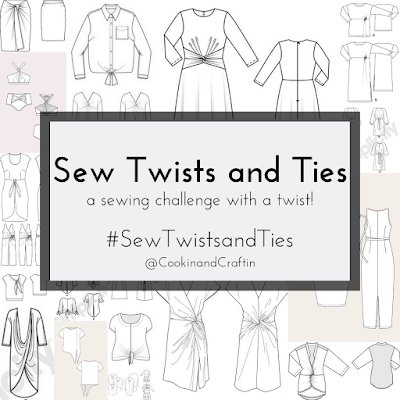 Another giveaway for Sew Twists and Ties! 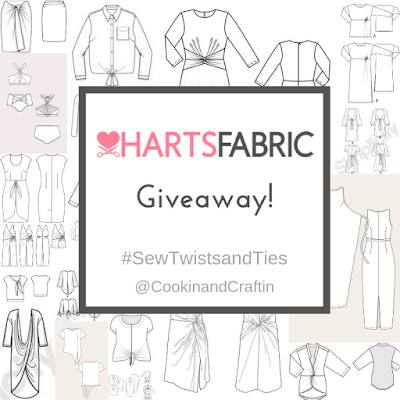 Hart's Fabric has generously offered to give away a $30 gift certificate to a lucky reader as part of Sew Twists and Ties! Hart's has an amazing selection of garment fabrics up for offer, so I'm going to highlight some of their fabrics that I think will work well for Sew Twists and Ties patterns! Hart's has a virtual rainbow of buttery and drapey tencel twill and tencel gabardine... remember I used their tencel gabardine for my Meridian Dress? How about this massive selection of jersey knits, which would work well for McCall's 7429 or the Itch to Stitch Nottingham Top? How about a rayon challis or viscose poplin for a Simplicity 8601 or a Hey June Key Largo top? Thank you for the giveaway, Hart's! Please enter below through the Rafflecopter link to win! UPDATE: The giveaway is closed. A winner has been chosen and notified. Thanks for your entries! I just bought Cashmerette Pembroke so some cozy knots would be perfect! I've been eyeballing the Jarrah top lately so I probably ought to pick up some fabric for it! Omg I need ALL THE FLORAL POPLIN! The Nottingham is still on my list and the Floral Rayon Lycra Knit Plum would work well for it! I love that Nottingham top so I would get some jersey for that pattern! I definitely need to make a Jarrah from that green sweater knit. Probably knit fabrics for a Style Arc knit twist top pattern I have had in my stash awhile. Mmmm the Nathalie Viscose poplin red! It's so bright! I would love to make some pants out of any one of their incredible selection of linen fabrics. That Blooming Rose Rayon is beyond beautiful! I'm all over the jersey knits for a lane dress. I've already got a couple of the rayon prints, haha, but I'd love to make something in the tencel twill, it looks yummy! I'd like to try the Nottingham soon, so I'd be digging into the jersey knits for sure. Do I have to choose? Harts has so many beautiful fabrics! Since I have to make a choice, it'll be the mustard background rayon crepe print for a Pembroke dress. Thank you Harts for the giveaway. I would get the mustard rayon poplin and make a relaxed work blouse! I love that poopy viscose rayone in navy and would make a dress of some sort! I totally adore Nathalie viscose Poplin Red❤ for a dress...🤔or....tencell twill Jade for...😊a dress! I have been hankering to get my hands on some tencel twill for summer pants and see that Hart's has a glorious shade of olive. I'd love to have a cut of it. I've been eyeing some rayon from hart's for Colette patterns oolong dress. Those floral viscose Poppins are calling my name! Ice been all about olive colors lately. I'd make another ruska! I would choose the Cotton Slub sweater knit grey to make a dress. I've already made a knottingham and love it so I'd probably just make another from some jersey. I'd love to try their tencel!!! I love the that mustard viscose poplin floral. Also the marbled wine and Ecru knit. I might make a Sinclair Lauren from the knit. The meridian dress in a green tencel sounds lovely! I have made Style Arc's version of this dress and am interested to see where it differs! Oooh, I love the Tencel Garbedine in jade. Maybe the longer version of the Salida skirt? Something in the Rayon for a new top. Wooooo! My mom lives right by it in Santa Cruz so I go whenever I visit, it’s great!!! I love their selection of Japanese fabric! I LOVE the blue Shibori style rayon!A twisty Sade? I'd make the Meridian dress in teal tencel twill. oh I just spotted some jersey that I would love to make a dress from. My juices have not flowed for a while so not sure what kind of dress. Mmmmm maybe the Jarrah in sweater knit. They have that gorgeous AGF Wanderlust rayon that would make such a beautiful Cashmerette Cedar Dolman. Love the viscose poplin in navy! I would make the new boheme skirt from Vanessa Pouzet, I've heard is a great pattern for beginners too. I would make a kielo wrap dress, but undecided on the fabric! Maybe someone could give me an idea.